And now for something completely different. Kudos to any of you Monty Python fans that actually understand that reference. As for the rest of you, it’s okay. We can still be friends. On that note, I invite everyone to click on these individual pics. In many cases here at Joe Kayaker clicking on a pic brings up a larger (and hopefully) better shot for you to observe and enjoy. These two pics are prime examples of exactly that. 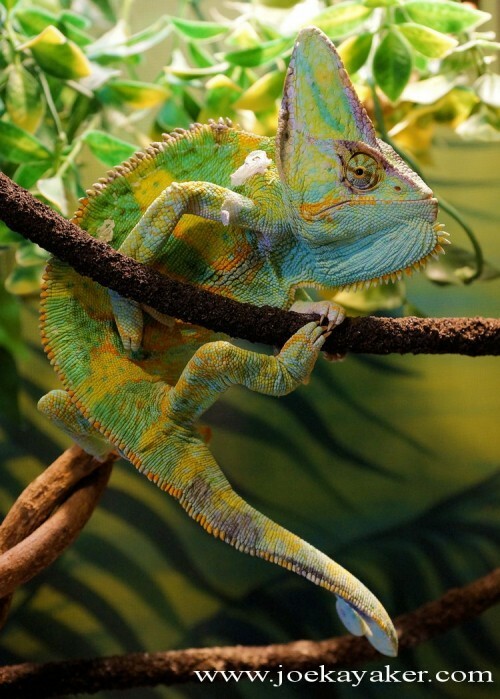 This is one good looking lizard and you should see him in all his glory. This handsome beast is a Veiled Chameleon. These guys hail from Yemen, which is just below Saudi Arabia. (I had to look that up). This is obviously a personal failing but whenever I think of the Middle East, my brain conjures up desert sands and oil. However, Yemen’s borders include just about as much waterline as it does dry land. 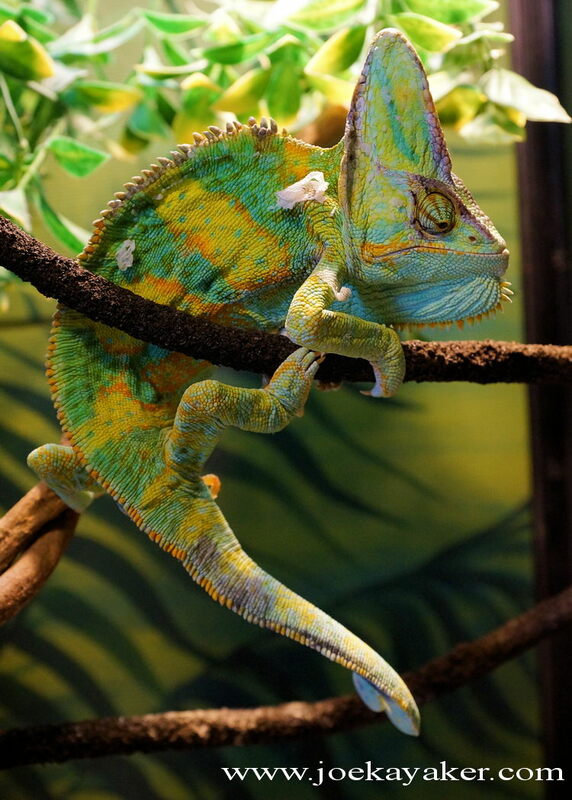 Not to mention some mondo good looking reptiles. I took an early morning hike through Avalon Preserve Friday. It was the first day of summer and truly beautiful. ‘Glorious’ as my friend Sue would say. As soon as I entered through the gate, Catbirds were serenading me. Always a good start to any day. 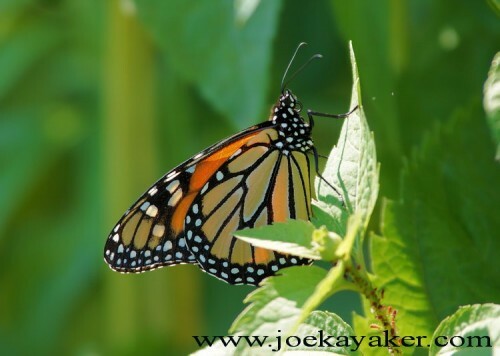 After climbing the stone steps to where the Frog Pond is – that’s what I call it, I don’t know that it has an official name – I found myself being serenaded by an entirely different set of critters. The banjo twang of the Northern Green Frog my not be as intricate or downright pretty as the melodies of the Gray Catbird, but to me it is no less welcome. When I was growing up, frogs (and toads) were everywhere. Their calls, especially at night, were a natural part of the landscape. 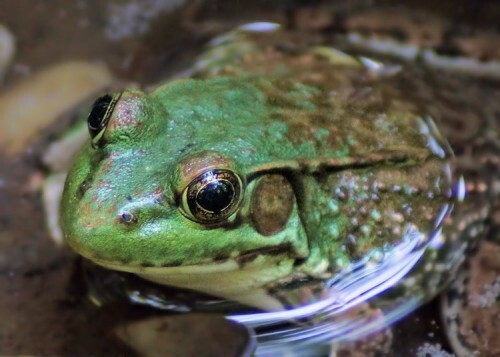 The choruses of several species of frogs near any body of fresh water was a given from early spring throughout the entire summer. But we live in a different world today. Amphibians have been in crisis for over two decades. They have been disappearing worldwide at an alarming rate. Those choruses that have provided the background soundtrack on this planet for over 370 million years are being silenced all too rapidly. These songs were already ancient when the first dinosaurs started showing up, let alone Catbirds. I miss those songs; I miss their sheer abundance. I think the whole planet is a lesser place without them. 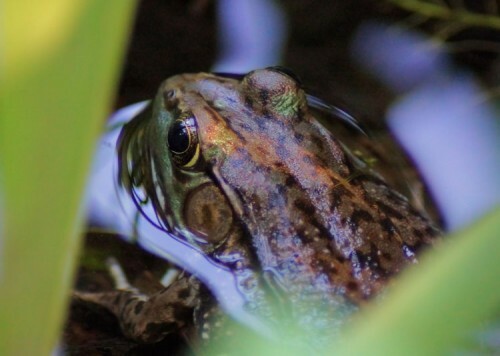 So when I tell you that I appreciate the song of our local frogs, from the deep bass of Bullfrogs to the high soprano calls of Spring Peepers and all those in between, please note that this is one occasion when I’m not being a wiseguy. I am not a birder and here’s the proof. On May 9th I posted this same pic and identified these birds as Common Terns. I was wrong. Wrong, wrong, wrong. 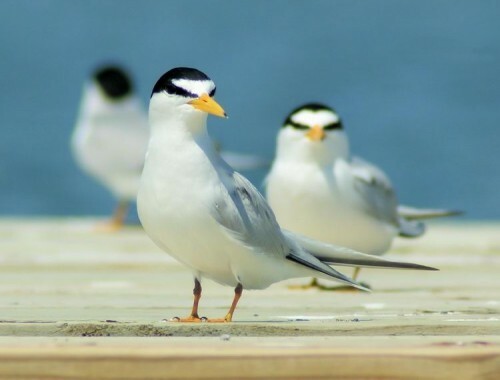 These handsome fellows are actually Least Terns. 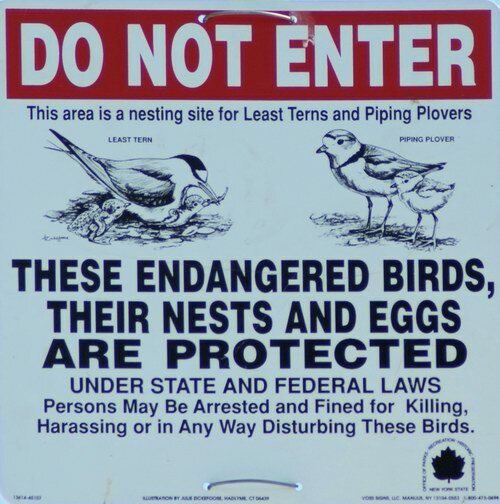 I was looking for Piping Plovers Sunken Meadow Park and I thought a pic of one the signs that marks the protected nesting areas of the plovers might make a nice addition to a post. 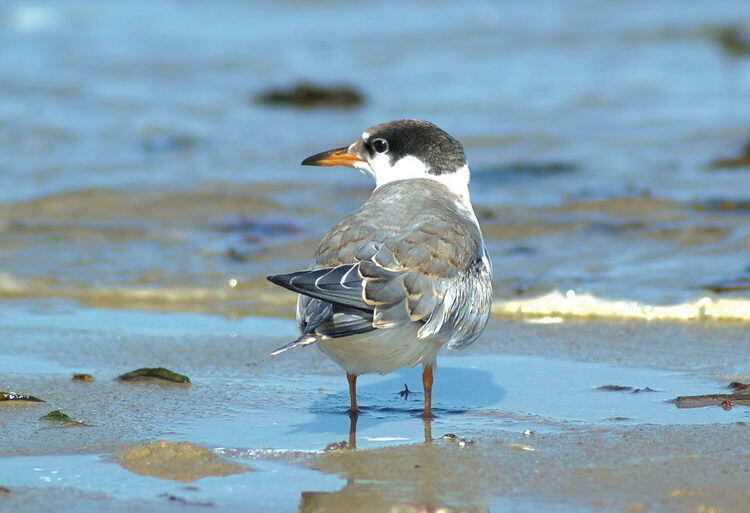 That was when I noticed that the signs also included Least Terns. The illustration on the sign looked suspiciously like the birds that I thought were Common Terns out of breeding plumage. Uh oh. I could feel an embarrassing moment coming on. So I emailed my friends Janine and Nancy at Sweetbriar Nature Center and asked them. 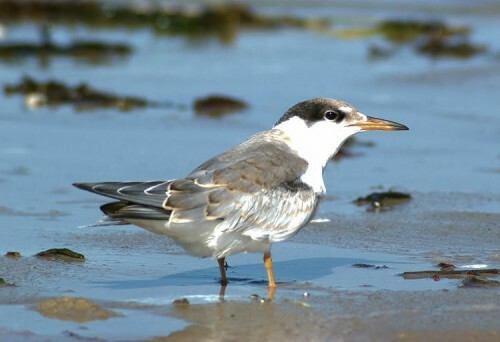 Janine originally wrote they were penguins in disguise, but I think she was just putting me on because then she identified them as Least Terns. Nancy was unsure so she forwarded my email to Birder X, another Sweetbriar educator, who also confirmed that the birds in question were indeed Least Terns. Birder X also informed us that these terns are threatened but that they nest here.